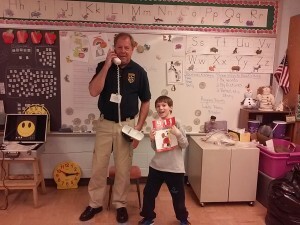 Atlantic Highlands: Sheriff Shaun Golden wa nts first grade students to learn how to dial 9-1-1 properly through the Monmouth County Sheriff’s Office SEEK (Sheriff’s Emergency Education for Kids) 9-1-1 program. On Feb. 23, first graders from the Mother Teresa Regional School in Atlantic Highlands were presented with SEEK 9-1-1, which is offered to elementary schools throughout Monmouth County. The Monmouth County 9-1-1 Communications Center serves 45 of the county’s 53 municipalities and receives approximately 1,600 calls per day.